Drilling has started - Help us develop geothermal! Valemount Geothermal Society hasn't added a story. July 3, 2018 UPDATE! It's been a while, but lots of stuff has happened in the background, and drilling for geothermal has just started! Borealis Geopower has received permits for four geothermal wells near Valemount, under the province's new geothermal resources act, and they are now drilling the first well, on the east side of Kinbasket Reservoir. The Valemount Geothermal Society has been working on a business plan to develop a hot pool project using heat/hot water from one of their wells! The province has just offered us a temporary license of occupation near one of Borealis Geopower's wellsites, but we need to put down a performance deposit and cover insurance in order to complete the offer. So we're aiming to raise $2500 right now, to cover costs like insurance and deposit. I’m Korie Marshall, and I am currently president of the Valemount Geothermal Society, a registered non-profit organization in BC. We formed the Society in May 2016 to show the community’s support for the development of a local geothermal project. Valemount is a prime spot to develop geothermal energy – we are very near the Rocky Mountain Trench, and there is a very hot spring nearby, though it is rarely accessible (though we did get to see it for about a week early this spring, when the reservoir was really low. We know geothermal can be a clean, renewable, low-impact source of heat and electricity – both of which can be used to attract new small businesses to the area and help existing ones grow. That will mean more and better jobs for local people, and more locally grown food! And we want to show the rest of the province and country they can do it too! We keep our membership fees very low - $10 – to allow as many people to join as possible. We’ve had members donate their time and efforts as well as funding and materials for our visioning sessions, and we've held events to bring together various local groups who are interested and involved in geothermal development locally. We're also working closely with Valemount Council's Direct Heat Use committee, which also wants to see geothermal development happen here in Valemount. We want to improve our local community, and to show the rest of Canada it can work - they can do it too! We have great volunteers who are dedicating their time and expertise to the efforts, but most things also require some money, so we are reaching out to the community and to all our friends online to ask for help. 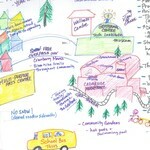 Please help us raise funds to help make a geothermal project a reality for Valemount! We thank you for your help, and look forward to sharing updates on how we are helping make geothermal heat and energy a reality in Canada! Valemount Geothermal Society hasn't posted any updates yet. Valemount Geothermal Society is managing the funds for this campaign.